It is important to dry vacuum carpet before steam cleaning it to remove the dirt and soil that is deep down. A regular vacuum cleaner cannot do this job. Hydro‑Force Brush Pro to dry vacuum this carpet BEFORE the hot water extraction process of carpet steam cleaning. You will not believe the amount of dirt, gravel, pebbles, small rocks and debris PANDA was able to remove using the Brush Pro. PANDA Carpet and Tile Cleaning uses the Brush Pro to remove this dry debris from YOUR carpet, before we begin hot water extraction. Not even the Rug Doctor can remove this debris. PANDA Carpet and Tile Cleaning serves the entire East Valley of Phoenix, including Ahwatukee, Tempe, Scottsdale, Paradise Valley, Chandler, Sun Lakes, Gilbert, Mesa, Queen Creek, San Tan Valley, Apache Junction and Gold Canyon. Please contact us today and we will be happy to help your flooring be the cleanest it can be. Trust the Power of the PANDA! Great information, will definitely recommend to future customers! Love the video as well! 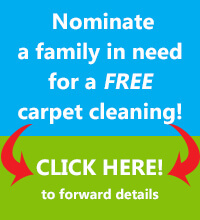 1 FREE Cleaning every month of the YEAR!! Had my carpets cleaned today by the Big PANDA! Excellent job, very reasonably priced, and educational all together. Thanks Herb - great work! Blower fans that drive air into the carpets, dry in minutes. Solid integrity behind this company, which is not often found in the service industry. I had PANDA carpet cleaning come and clean our carpets in our home. We have been pretty lax in the care of our carpet over the past year and the traffic areas were pretty disgusting. Anyway, Herb showed up with a bunch of equipment and went to work. He had one piece of equipment which I had never seen before. It was an electric brush gizmo which raised all the carpet fibers up on end and basically took all of the matted down carpet back to life in a split second. He used several different processes in each room which made the carpet look better than it has looked after ANY of the cleanings we have done in the past. After getting the carpet clean, he put some powerful fans in each area and it was nearly dry by the time he left. I also had him clean the grout in our downstairs tile. I had actually forgotten what color it had originally been. When he started, the grout was dark brown, but the cleaning returned it to its original almond color and it looks FANTASTIC. PANDA took a while longer than the company we had been using in the past. Using that carpet fluffing machine and all those steps was surely what took the extra time, but it was really worth it. Our carpets and tile look like new, and PANDA has my business from here on. PANDA did such a great job on our carpets this last weekend. I've never seen a service vacuum before they actually shampooed...they went over and above my expectations and my carpet looks amazing - just in time for our out of town visitors for the holiday. THANK YOU FOR GETTING US PANDA-tized.....I HIGHLY RECOMMEND PANDA FOR ALL YOUR CARPET AND TILE CLEANING SERVICES! I had PANDA come by and clean my carpet and tile, what a great professional job. Everything looks great and not to mention very professional. Highly recommend PANDA to my family and friends.